Trombonist/composer/music professor George Lewis actually spent this past week in Pittsburgh for a residency at the University of Pittsburgh. On Tuesday night, he spoke on a panel, Thursday night he lectured about his book on the AACM and Friday and Saturday nights were devoted to his compositions. I couldn't make Tuesday's night, recovering from the previous night's events, and on Thursday I opted for the Ches Smith et all show (see previous post for details; and check this out for my profile on George Lewis, Jack DeJohnette and Jeff "Tain" Watts). Friday night, Lewis staged a performance of his composition Spooky Interaction, Lesson II (2016) at Pitt's Bellefield Hall. He and Geri Allen were to perform onstage there. In Irvine, California, flutist Nicole Mitchell and trombonist Michael Dessen were going to perform with them, through an internet hookup that Lewis referred to as "Skype on steroids." Saxophonist Francis Wong would also be part of the mix too, in San Francisco. As if that concept wasn't enough, two additional pianos were set up in Pittsburgh and Irvine. Both would be part of the performance, playing "themselves" courtesy of Lewis' Voyager interactive software which enables them to analyse what is being playing around them and use that knowledge to generate more music. The West Coast participants were visible to us through a screen projected at the back of the stage. Everyone could hear each other clearly when they spoke beforehand. The only time things seemed out of sync was when the director of SF Jazz (where Wong was set up) spoke. The image didn't match up with the words. Before it started, Lewis, who makes all of this work seem very accessible and engaging, told us to "listen for resonance and interaction...that you may be doing in your daily life as you muddle through." He was implying that improvisation is not merely something that is done onstage with instruments. It's a daily occurrence. When we spoke he talked about the upcoming Oxford Handbook of Critical Improvisation Studies, which will detail this at great length. Without any genuine adieu, Lewis told Wong to start the performance on his own, and the trombonist left the stage. For about the next 40 minutes, the music came in waves, with each location taking roughly four minutes (the timing was explained afterwards) before passing it on to the next group. This was free improvisation, beginning calmly and moving in waves. Dessen and Mitchell entered with some high slides and guttural flutters, respectively. When Lewis and Allen started playing, they offered some of the most exciting parts of the piece, not just because we were there in person. (The other locations came through loud and clear, incidentally.) Lewis later quipped that he looses his technique after ten minutes of playing, but when he was playing there was no weakness on display. He sounded extremely expressive, adding rapid vocal sounds in the upper register. It was the kind of tone that exudes authority. Allen was the same way. Sometimes she was pensive and lyrical, other times she was putting her elbows on the keys for punctuation, adding a Cecil Taylor-esque percussive quality. The other pianos started playing about ten minutes into the piece. Visually, it looked like the Invisible Man was playing them. Keys were moving, sound was generating and it did work within the context of the piece. It seemed like it might be hard for the participants to hear each other clearly but they seemed to do fine. The secret might have been that no one ever got too loud. When all five of the live musicians started playing together, it was of course rather wild, but never too busy and crowded. After about 40 minutes, everything faded down. Lewis commented later that this was the first time that the piece was performed and everyone ended together. I'm not sure how many seats Bellefield Hall has, but it was pretty full, in part probably because it was a free show. The audience was made up largely of students, who may or may not have been there as a requirement or for extra class credit. I have to wonder what they thought of the show because as soon as it was done, I mean after the final note and right as the participants were preparing for Q&A, there was a massive exodus toward the door. Afterwards, I managed to tag along with Lewis and Allen to a sort of afterparty at the eatery the Porch, which was just down the street. Sitting next to him, I got to chat about the Yankees album he made with John Zorn and Derek Bailey (my introduction to him) and listen to him tell stories about his works. He was extremely down to earth, listening intently to everyone, and even stopping in front of the Carnegie Museum to take a picture of Dippy the Dinosaur (who was wearing a knit tie) for his son. I can't think of a week that was as jam-packed with music as the current week. It began on Monday night with Kurt Vile & the Violators who played a sold-out show at Mr. Small's (that's not them in the picture above). My old Pitt/WPTS friend Jesse Trbovich has been playing guitar, bass and saxophone with Kurt for several years and he helped me get a ticket after I waited too long to get one on my own. I don't really know a whole lot of Vile music but I really enjoyed the show. There was a lot of mid-tempo groove stuff going on, but the way they colored in the songs made all the difference. Jesse's alto got buried in the mix for the one song he played, but I could sort of feel it. After the set, I yelled out Jesse's name at the stage and he jumped off and came down to chat. I haven't seen that guy in over 15 years, no exaggeration. And despite being in a super-successful touring band, he's still one of the sweetest guys there is. Always has been. I miss that dude. But a lot of rock and a short chat really made my night. 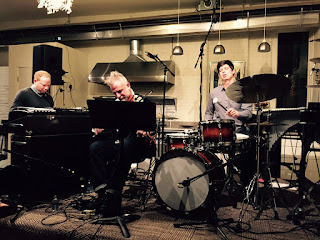 Then on Thursday night, I saw the guys in the photo: Ches Smith (drums), Craig Taborn (electric piano) and Mat Maneri (viola) at the City of Asylum loft/space. (To read my preview of this group, go here.) This same space presented Mary Halvorson and Stephan Crump last April, but back then it was a very casual, intimate set-up. This time, they had a whole stage set up, with mikes and everything, and whole lot more chairs. Note: Those three orbs that look like they're hanging above Smith's head are actually lights further behind him. Though it would be cool if they were percussive bells. 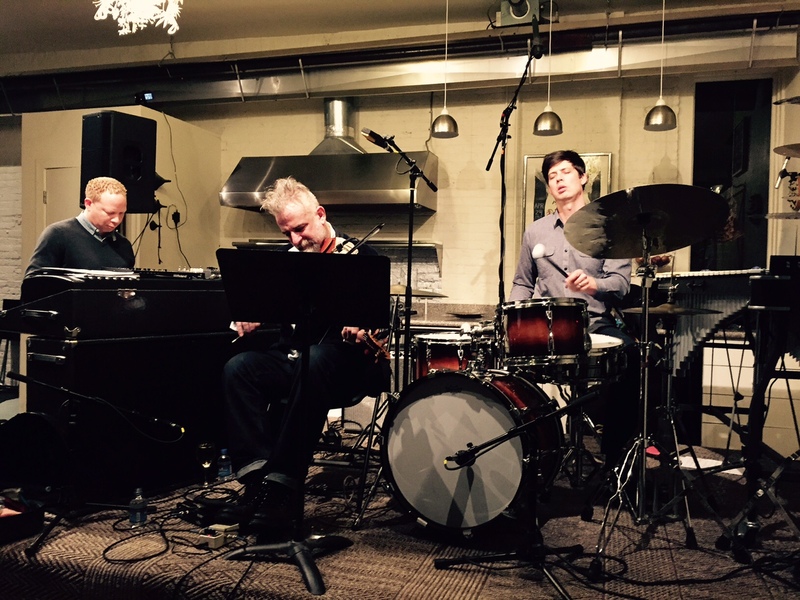 The trio just released The Bell, an album on ECM and they also performed at Jazz Connect last month in New York. Their music is based largely on improvisation, though written themes very slowly creep in after they've had a chance to stretch out. That was really the case on Thursday. Snatches of themes from the album occasionally popped up, tying things together. Maneri or Taborn often came back to a riff or even just a series of notes, but most of the time, things were left to chance. Sometimes things had a pointillist quality to it, but there was always a lot of forward movement to the sound. You always knew that it was proceeding towards something. This was the penultimate date of the tour, so after a series of shows, the guys were really in tune with one other. Smith had his vibes there, which he played with four mallets, occasionally bowed and played percussively by running a drum stick across the pipes, sometimes while sitting at the trap kit. Taborn normally plays acoustic piano with this group, but he used a Rhodes on this night since they couldn't get a piano up the spiral steps of the loft. It added greater dimension to the music, creating droplets of sound during one of the more gentle parts of the evening. Maneri amplifies his viola, adding some effects pedals to in, including one that drops the pitch down to bass level. A few times, it got so low I was wondering if it would shatter the amp's speaker. During my interview with Smith, after the Jazz Connect set, he mentioned that he "always has bands that repeat things way too long." True to form, they repeated the final section of "For Days" a few times longer that it should have lasted. But sometimes it's hard to stop once you get a good thing going. One other impressive part of the night, besides the music, was the turnout. The room was packed with what seemed like around 70 people. (I'm bad with figuring out numbers visually. It could have been more than that, or a tad less.) That might not sound huge for a show, but in that room it was, and on a Thursday night in Pittsburgh at a free jazz show - it's a rarity. And maybe a sign of good things to come, together with the equally populated Ethnic Heritage Ensemble show from the previous week. It's been a couple weeks since the show, but I feel like I should mention the Ben Goldberg Invisible Guy Trio's appearance at the Thunderbird Cafe, which happened on Monday, Feb. 8. I missed this group the last time they came to town because I was playing with the Love Letters the same night, and hosting Matt Bauder's trio Hearing Things, one of the greatest examples of bad timing ever. Goldberg is an amazing clarinetist. As in, you never realized that instrument had the potential to do this kind of heavy music before (unless you've followed the prolific Mr. G, or Perry Robinson or Don Byron, to name just a few). His trio mates were Michael Coleman (keyboards) and Hamir Atwal (drums). The sound was never spare and never ventured so far into the free dimension that it lost its sense of swing. That was probably due in part to Atwal, who had an ecstatic smile on his face through most of the set that I caught. At the start of the second set, Goldberg was playing some loopy introductions that seemed kind of circular, and slowly settled into a form. It was a pleasant surprise when it became clear that they were playing "Light Blue," one of Thelonious Monk's deep cuts and a song that can very easily turn lugubrious. (Check out the composer's version on the Always Know album, which proves what it was initially passed over.) But these guys, Atwal mainly, made it swing. It was hard at times to tell when one composition ended and the next started. One of the tunes was recently released on an album of duets that Goldberg did with pianist Myra Melford, and it seemed to take on a larger life than that version. Coleman had a couple different keyboards, adding an approximation of electric piano at times and parts that acted as bass lines too. It was a great show that, typically, was patronized by just a small but devoted group of listeners. The fact that it was a Monday night might have had something to do with it. This past Saturday, however, the Undercroft Gallery at First Unitarian Church was filled with people there to see the Ethnic Heritage Ensemble. This time drummer Kahil El'Zabar was accompanied by Craig Harris (trombone, digeridoo) and Hamiet Bluiett (baritone saxophone, clarinet). (I profiled Bluiett in City Paper last week and it can be found here.) This was quite a pleasant surprise, not realizing that such a diverse crowd would come out for such an adventurous group. Perhaps the weekend date has something to do with it. The guy who put on the show said my article might have helped. I'll leave that to others to debate. EHE's set followed a similar pattern to others they've done on previous visits. El'Zabar starts off on mbira (kalimba) playing a droning "riff" and tapping the bells on his ankles. Then a tune from the drum kit, then one with hand percussion. Second set followed the same pattern. But within that set, there was magic. The first trap kit song was a woolly version of Wayne Shorter's "Footprints." Without the support of a bassist, the drums still seemed to create a droning "note" that acted as a pedal point. The second set's trap kit song was John Coltrane's "Impressions" which also held together without a rhythm section. For the final hand percussion tune, the group made a surprising choice of "Cherokee" that inimitable swing song that later became a bebop proving ground. During my interview with Bluiett he talked about suffering from a stroke and injuries to his rotator cuff. He moved around slowly between songs and solos, but most of the time he sat on a piano bench in front of his baritone, which was perched on a stand. Yet when it was time to blow, he blew hard. His upper register work was as impeccable as ever. Like Ben Goldberg, he blew the B-flat clarinet with clarion force that probably surprised many. Craig Harris put on a pretty muscular performance too, especially when he blew the didgeridoo. This wasn't your typical Australain didg either. It was a long piece of wood with holes in either end. Yet he blew a drone with gale force, taking time to throw in a solo too. Both El'Zabar, that night, and Bluiett, on the phone a few weeks earlier, talked about being on a tour that was all about healing. It might sound flaky (or old) to say it, but the world could use a good deal more of that right now. And that night, their beliefs weren't merely idealistic words, they became reality. Usually I'm not one to ask people for their autographs. In fact, I recall being at a show where I mentioned being a fan of the performer and I was nauseated when someone from the production company chirped, "Maybe you can get [the performer's] autograph tonight!" Never mind that I had spoken with the person before and we were sort of acquainted. I just don't see autographs as a way to bond me with someone. But every so often, I'll go against the grain. Like last week, as seen in the picture above. Author Robin D. G. Kelley spoke at Pitt. I loved his Thelonious Monk biography so much that I really didn't want it to end. It's really exhaustive in its details, and written so well. So I had to have him autograph the book. He said that he too didn't want the book to end when he finally was done with it. Understandable, considering he spent about 14 years on it. Then we got into a brief discussion about a few Monk performances at Newport. I mentioned using the book as a reference when reviewing the album of the 1959 set. Then Kelley started talking about the year that they played "Japanese Folk Song," and how Charlie Rouse was on fire during that tune. Turns out it was one of the few Monk albums that I don't think I have (outside of the umpteen quartet dates from later tours). Kelley was actually in town to talk about Errol Garner, due to the Garner archive being housed at Pitt. He made a pretty compelling argument about the relationship between the pianist and his manager, Martha Glaser. Interesting stuff. There's been all kinds of stuff going on in town over the past couple weeks. Ben Goldberg's trio was back here two Mondays ago. This past Saturday, Kahil El'Zabar brought the Ethnic Heritage Ensemble back to town, this time with Hamiet Bluiett and Craig Harris. Details are forthcoming. Yesterday I made a late afternoon pilgrimage to Jerry's Records. My main reason was to see my bandmate Mike, but of course you can't simply pop into Jerry's and pop back out (unless you're picking up stuff you won in a recent auction). I wandered over to the jazz section, poked around, grabbed a few things and made my way back out to the main room. I asked Mike if Lovin' Spoonful's first album, Do You Believe in Magic, ever came in. The band's other albums are fairly common in that store, and I have all of them. The myriad compilations (there exist about two for every proper Spoonful album, more than most bands I think) are a dime a dozen. Mike insisted that there should be a copy of Magic in the band's section. When there wasn't, he strolled to the back stock wall and found two copies up there. I bought one and he put the other one out in the section. A quick search on this blog will tell you I'm a champion of the band. Some people might dismiss them as lightweight, but musically they had a lot going on. Lyrically too, for that matter (check out the third verse of "Darling Be Home Soon," or all the internal rhyming of "Jug Band Music). For some reason, during my heavy Spoonful/'60s days, I never owned their first album. I've heard most of it through compilations that I've owned. But it's good to have it all in order, the way these 20-year-olds wanted it to be heard back then. Like Jerry's Records, it was a second floor walk-up and, possibly around this time, it was owned partially by Jerry Weber. (Within a year or so, he sold his half of the business and opened Garbage Records, which he later rechristened with his name.) Now I had loved records since the time I could crawl, but this was my first real experience with a used record store. Unlike Heads Together and National Record Mart - where I used to go weekly and flip through same stuff - there was new stuff here every week. Crazy covers. Records I'd read about but never thought I'd see. And I could afford them! When I started delivering the Post-Gazette, that opened up the buying opportunities even further. Of course, there would be other used stores I'd discover in town, but for me, this is where it all started. c. you hold onto it, thinking you might buy it or at the very least, play it on the store turntable. There's so much music out there now, that how the hell are we supposed to find out if we like it? A band name? An email? Radio? I hate to break it to you p.r. folks out there, but I get so many damn emails a day that it takes a lot to get me to open them. I remember going into Paul's CDs and having Paul treat me the way a neighborhood butcher treats a regular customer: He just got something in that he knows I would like. And he'd pull something out from behind the counter. I loved that. People knew what you'd like, and finding things for you. That was a great way to build a customer base and for commerce to exist. And for a community to grow. One critical angle that has probably become cliche by now is the opening line where the writer admits that, upon first listen, s/he wondered if the wrong album was cued up, so surprising are opening notes. In the days of records, the idea would have been far-fetched. In the CD age, it's a tad more likely. I once got a generic latin jazz disc that actually contained King Cole Trio songs. And I once got a mislabeled ECM promo. But I say this in all sincerity: I did wonder, when Mauch Chunk started up, whether I was listening to Mostly Other People Do the Killing or some other group entirely. 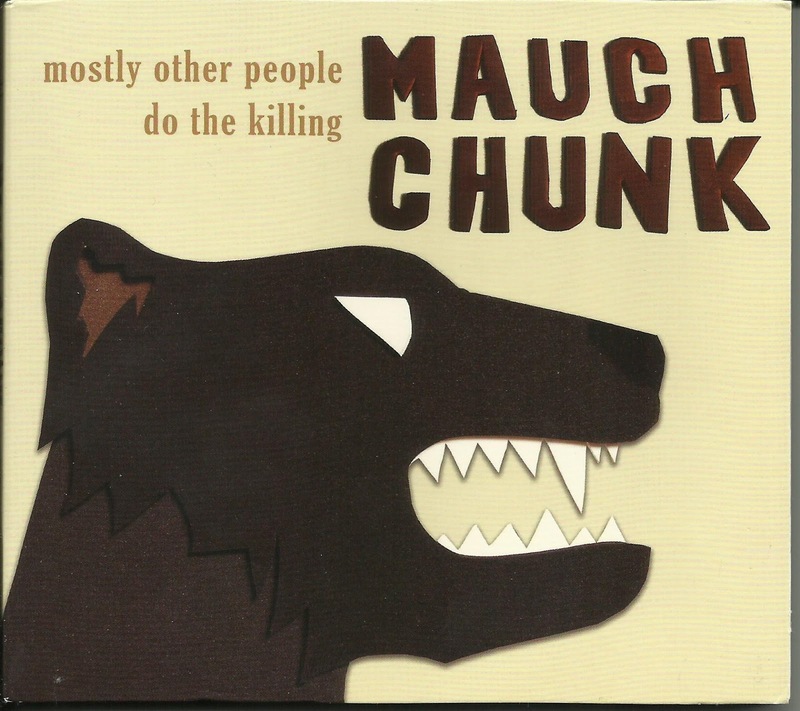 Expecting some sort of two-part trumpet-sax melody against a frenzied rhythm, instead "Mauch Chunk Is Thorpe" greeted the ears with a pounding Tynerish piano riff. The rhythm section was fairly straight-forward, at least for a MOPDtK session. Peter Evans' trumpet is conspicuously absent here, and everywhere else on the album. Of course it was MOPDtK coming through the speakers. Before long the drums took on that the Animal-meets-Elvin-Jones style that could be no one else but Kevin Shea. Pianist Ron Stabinsky has also been part of the group on recent albums. During this track's piano solo, Jon Irabagon's alto adds commentary that almost sounds like he's grumbling, "Why, I oughta," before he himself unleashes his own blend of upper register leaps and squonks, eventually leading the tune's calm conclusion. A few albums back I worried that the band's cheeky performance could wear thin. If you poke fun at the old guard the whole time, the shtick will get old and overshadow the music. But since then, they've come around. Bassist Moppa Elliot's concepts have evolved to a point where the humor remains but the structures have become more complex. They're having their cake and eating it too. Just when it seems like the band might have actually settled down into something accessible, they take great delight in jolting the listener. The best example comes in "Townville." (Once again all the tracks are named after cities in Pennsylvania.) Started off with a clipped hard bop line, with Stabinsky throwing chords at Irabagon's plucky alto, it quickly starts to pull apart. With everything spilled on the floor, Irabagon inserts an exaggerated quote from "Bewitched, Bothered and Bewildered." And that's just the first two minutes of a nearly 12-minute piece. Each track is dedicated to a different artist, from a neighbor to a dancer to jazz legends Henry Threadgill, Dave Holland and Sonny Clark. The dedications don't specifically play to the honoree's personality and the group does push things to the limit. The bossa nova "West Bolivar"(for Caetano Veloso) begins with Irabagon blowing, presumably, into his horn without a mouthpiece or maybe a neck, and later Shea almost derails the groove of the piece. At the same time, they settle down for "Niagra," a ballad that pays tribute a friend who gave the group their first show. And amidst the relative tranquility, the structure is built on unusual lengths in the phrases, which still keeps you engrossed in the music, wondering where they're headed. Reverent yes, but never maudlin. Not by a long shot. And it's good to see the oddly named city of "Mehoopany" finally get honored with a piece. The fact that it's sort of a boogaloo makes it even better.